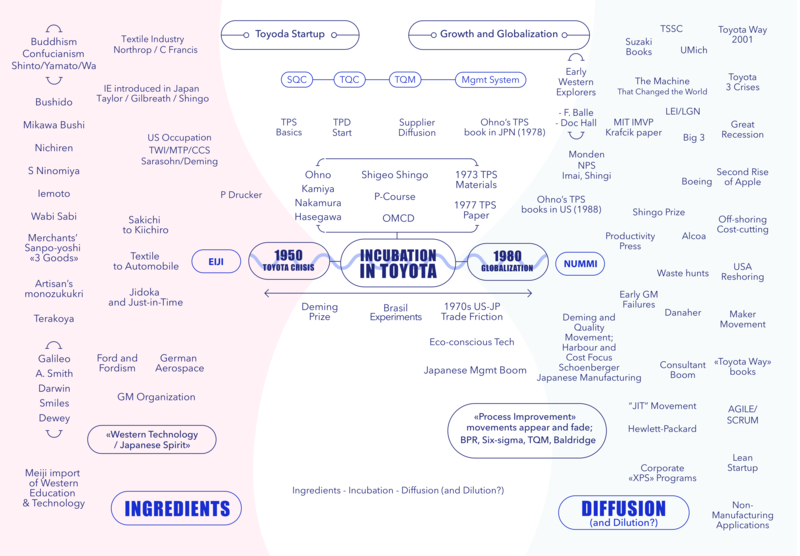 The leftmost column seems to describe mostly Sakichi Toyoda’s personal cultural background and the link between some of these items and TPS, the Toyota Way, or Lean strikes me as far-fetched. Terakoya, for example, were primary schools. They taught reading, writing, and the abacus for calculations. I don’t see a direct connection with the specifics of TPS, as different from, say, mass production. Nichiren is a nationalist cult whose practice consists of chanting the Japanese title of the Lotus Sutra a million times to achieve enlightenment. My closest exposure to it was working in a Japanese office where the manager was a member of this and systematically favored his coreligionists, who tried to convert me. Crediting Shigeo Shingo (1909 – 1990) with introducing IE to Japan pre-1950 is a generational stretch. As Mark Warren suggested, Yoichi Ueno (1883-1957) seems a better fit. I am also puzzled by the credit given to Peter Drucker, whose career was mostly after 1950, and whom I think of as the pied piper of American managers, wrapping bad ideas in such an attractive package that they all fell for them. What does John Shook think he contributed to Toyota? The last column on the right, on the diffusion side, contains many events that occurred since 2001 but are not related to TPS or Lean in any way I can see, like the Great Recession or the off-shoring moves by US and European manufacturers chasing low labor costs. I am also wondering why he includes efforts like Agile/Scrum or Lean Startup that strike as unrelated to the topic. The Offshoring/Cost-Cutting item shown was one of the results Lean (tools) adoption by large, financially-focused corporations. It manifested itself in the following ways: 1) Lean was poorly implemented and costs were not reduced, so the process was offshored. 2) Processes were improved, setting up the process to be offshored, and 3) Processes were improved and cost reduction was achieved, but costs needed to be reduced further and the process was offshored. Including this is the chart is both honest because it reflects what actually happened, and odd because they acknowledge a negative outcome (layoffs) closely associated with Lean — which tangibly hurt tens of thousands of employees and their families. The explanation they provide in the pop-up box is not a fully accurate explanation for what happened. The Offshoring/Cost-Cutting item shown was one of the results Lean (tools) adoption by large, financially-focused corporations. It manifested itself in the following ways: 1) Lean was poorly implemented and costs were not reduced, so the process was offshored. 2) Processes were improved, setting up the process to be offshored, and 3) Processes were improved and cost reduction was achieved, but costs needed to be reduced further and the process was offshored. Including this is the chart is both honest because it reflects what actually happened, and odd because they acknowledge a negative outcome (layoffs) closely associated with Lean — which tangibly hurt tens of thousands of employees and their families. The explanation they provide in the pop-up box is not a fully accurate explanation for what happened. And I agree that Ueno is a better fit for the introduction of IE to Japan.